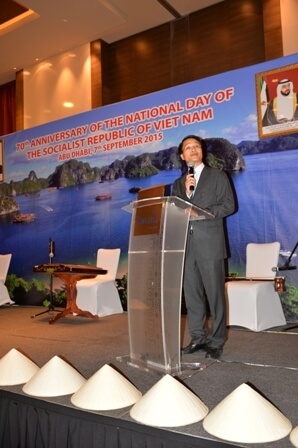 On the occasion of the 70th anniversary, successful August Revolution and National Day Republic of Socialist Vietnam, September 7, 2015, the Embassy of Vietnam in the UAE has long held a National Celebrations Independence Socialist Republic of Vietnam with many diverse activities at Park Rotana, Abu Dhabi. More than 300 guests attended the ceremony to mark the National Day, including government representatives UAE, the UAE Ministry of Foreign Affairs officials and ministries, diplomatic corps, representatives of businesses and the Vietnamese community in the UAE . Immediately after the flag ceremony and the national anthem of the two countries Vietnam – UAE, in the solemn atmosphere, Ambassador Pham Binh Dam has reviewed the glorious journey of the people of Vietnam, the great achievements gained in the cause building and protecting the country during the past 70 years. Ambassador stressed the exceptional efforts and outstanding achievements of Vietnam in the fields of foreign affairs, politics and economics on the path of international integration, national development. Vietnam bilateral relationship – the UAE is growing steadily and effectively in the areas of foreign affairs, politics, investment, trade and prospects will continue to expand in the areas of tourism and education. Bilateral trade turnover in 2014 was over $ 5 billion. Currently, the UAE is the largest export market of Vietnam and the 5th is an important partner of Vietnam’s leading in the Middle East. Event space imbued with Vietnamese air with the images of Vietnam, the famous dish of Vietnam. In particular, the event has the participation of artists from Vietnam to promote the culture, the country of Vietnam. National mourning due to coincide with your date, the artist has replaced regular performances by the exchange with the guests and expressed some folk dance movements. 70th Anniversary of the National Day and the cultural exchange activities, gastronomy has left a deep impression in the hearts visitors. Nostalgically leaving anniversary night, many guests expressed their will to Vietnam certain.